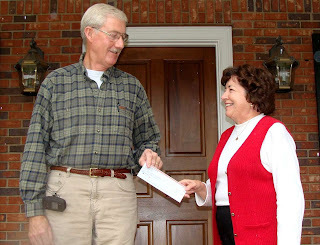 The Micajah Clark Dyer Foundation received a generous gift from Kenneth Dyer of Dahlonega. Ken made the gift to assist in restoration of the gravesite and placement of a memorial headstone at the Old Choestoe Church Cemetery to honor Georgia’s pioneer aviator, Micajah Clark Dyer. Installation of a slab over Clark’s and wife Morena’s graves has already been completed and design of the memorial stone is presently underway. Engraving on the stone will honor Dyer for his invention of an aircraft in the 1800s, which incorporated flight controls not previously known in aviation. The original headstones of Clark and Morena will be inset in the new stone; the total project is expected to be completed within the next ninety days. Sylvia Dyer Turnage, treasurer of the foundation, said, “The Foundation has received approval from the IRS as a 501(c)(3) organization for the purpose of further educating the public about Micajah Clark Dyer’s important historical invention. This status allows donors to take an income tax deduction for their gifts.” She said the names of all donors to this project will be included in the program for the dedication ceremony planned for early next summer. This year's reunion will be a time to re-connect with family members near and far, to share some great food and fellowship, to honor those recently deceased from among us and welcome new additions to the family. We will also have the opportunity to learn a little about our many forebears from the time of the Revolution, as well as what is known of their service to the cause. Registration begins at 11:00 a.m. The meal will begin as close to noon as possible, and we will have a brief business meeting, memorials/recognitions and a short program starting about 1:00 p.m. The location is the Choestoe Baptist Church Fellowship Hall. An article published in the April 23, 2009 issue of the Union Sentinel by writer and historian Ethelene Dyer Jones tells about the life of John Andrew Wimpey (1887–1980). 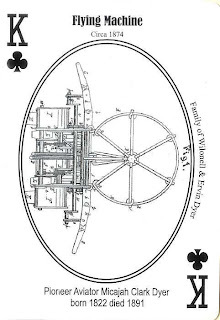 Johnny Wimpey was the grandson of Micajah Clark Dyer (1822–1891), who invented a flying machine in the North Georgia mountains during the mid-1800s. The reason for some skepticism about whether or not Clark Dyer actually invented an airplane in the late 1800s was that the modern standard of documentation, typically photographs and records, couldn't be produced by the family. No one knew what happened to the patent or the flying machine after Clark’s death. The family had searched for Clark’s alleged patent in every place they knew to look – the National Archives, Library of Congress, Dun and Bradstreet records, but didn’t succeed in finding a trace. Then, in late 2004, a great-great-great-grandson, Joey Dyer, was searching the Internet when he managed to locate Clark’s patent in the U.S. Patent and Trademark Office. What a discovery! The family was elated to finally see Patent No. 154,654 that was issued to Clark on September 1, 1874 by the U.S. Patent and Trademark Office. The sophisticated drawings and detailed specifications of the flying machine he had included in his patent application were most remarkable. 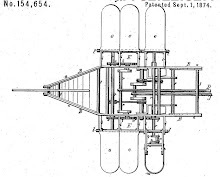 The aeronautical principles Clark had addressed were ahead of those that others trying to invent a flying machine had yet envisioned at that time. He included many innovative features: a power source, a rudder for steering, paddle wheels for acceleration and deceleration, jointed moving wings to increase or decrease altitude, and a wedge-shaped hull with inclined prow to reduce wind resistance. In the year following discovery of his patent, two 1875 newspaper articles were discovered that reported Clark’s invention: the St. Louis Globe-Democrat, dated July 16, 1875, and The Eagle (Gainesville, Georgia), dated July 31, 1875. 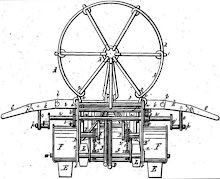 A comment in The Eagle article reveals the length of time Clark had been working on his invention and the depth of his conviction in his ability to get his craft airborne. Mr. Dyer has been studying the subject of air navigation for thirty years…he himself has the most unshaken faith in its success, and is ready, as soon as the machine can be constructed, to board the ship and commit himself to the wind. Finally, in July 2006 public recognition was given to Clark’s invention by erection of three highway signs declaring State Highway 180, from its junction with U.S. Highway 19/129 to the Brasstown Bald Mountain Spur, the “Micajah Clark Dyer Parkway.” Other recognitions followed: Proclamation of “Micajah Clark Dyer Day in Union County on Sept. 1, 2006; first class U.S. postage stamp picturing Clark’s flying machine Oct. 28, 2006; nomination for Clark’s induction into the Georgia Aviation Hall of Fame Oct. 30, 2006; framed copy of the stamp displayed in Union County Courthouse Jan. 15, 2007; permanent display of Clark’s patent, model of his plane, and a book containing the illustrated story of his invention in the Union County Historical Museum in January 2008; and a playing card featuring a drawing from the patent included in the deck produced by Union County Historical Society Dec. 10, 2008. Also, the story of Clark Dyer’s flying machine has been carried by numerous newspapers, radio and television stations, and live presentations have been made to many different groups throughout the past several years. Realizing that much remains to be done before the state and nation become aware of this important piece of history, a Steering Committee was established in September 2008 to work on several projects, such as restoration of Clark’s gravesite, locating someone to reproduce the flying machine and planning construction of a museum for displaying the replica.